A constant breeze, wide-open expanse over Lake Michigan and five hours of aircraft, helicopters, rescue boats and paratroopers. What more could you ask for? 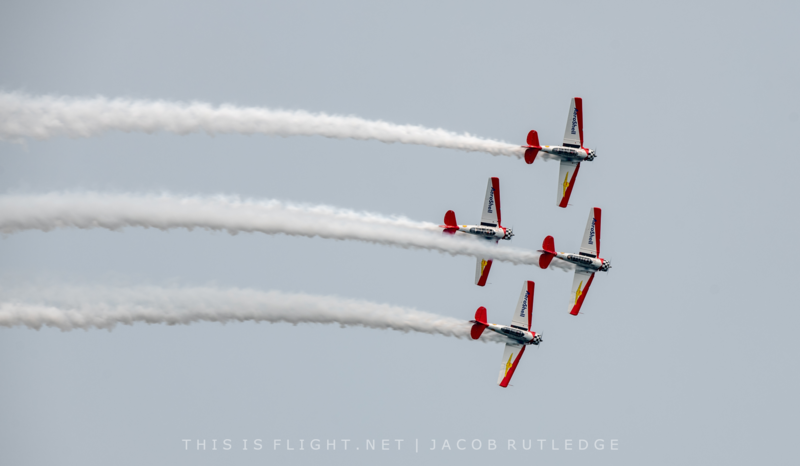 This was the first time I attended the Chicago Air and Water Show, and the 2018 edition included a few surprises. If I had one word to describe the show, “big” comes to mind. The viewing area is huge and the acts are plentiful, and being located in the middle of the third largest city in the United States brings huge crowds – over one million people each day attend the airshow. The airshow was scheduled to start at 10am although an American Airlines Boeing 787-8 was performing slow circuits around the air box by the time I arrived before 9am on the Sunday. Immediately before the show started the 787 was brought into the box for a few slow passes. Once the show started it recovered back to the airport and did not appear during the show again. I recognize the cost is immense to operate the aircraft but I would have liked to have seen some more passes through the air box in both clean and dirty configuration. The 787 is a beautiful aircraft that left the crowd wanting to see more. 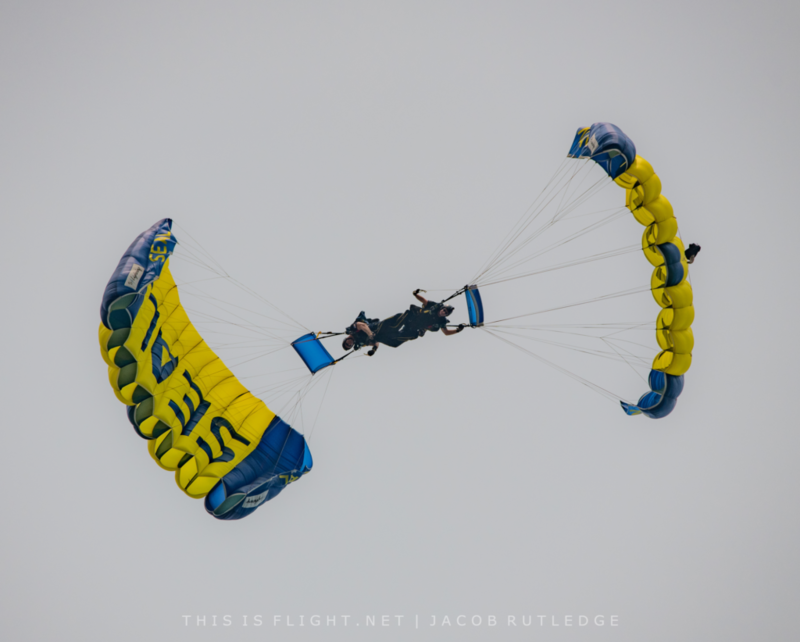 The show officially started at 10am with the national anthem and both US Navy Leap Frogs and US Army Golden Knights releasing multiple rounds of jumpers. Once the jumps were complete, the C-130 used to get the Navy Leap Frogs to altitude flew a pass in front of the crowd. At this point I noticed the show line seemed to be a little further out than I had expected given the show was out over the lake. 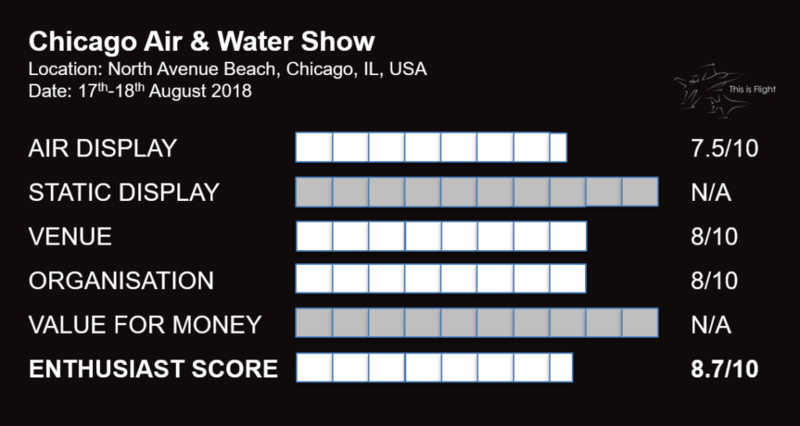 While I do not have any official material stating the exact air box coordinates, I believe this has do to the fact that the show largely within a bay and show center was based in the middle of the bay . Given this was my first time at the show I stayed at show center to take it all in but I believe there may be better paid and unpaid views if you are willing to forgo watching the parachute teams land and watch the show from a position away from show center. After the C-130 pass, the Firebirds Xtreme aerobatic team consisting of Rob Holland (MXS-RH) and Jack Knutson (Extra 300S) started their demonstration. 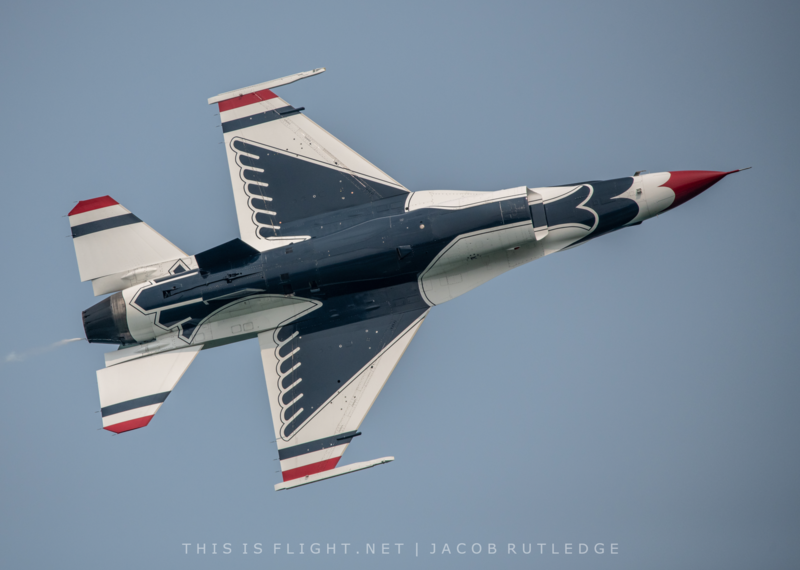 Particularly impressive was their ratcheting maneuver – similar to the reflection or mirror pass from the Thunderbirds except the team starts in the mirror configuration before both aircraft roll to switch positions. 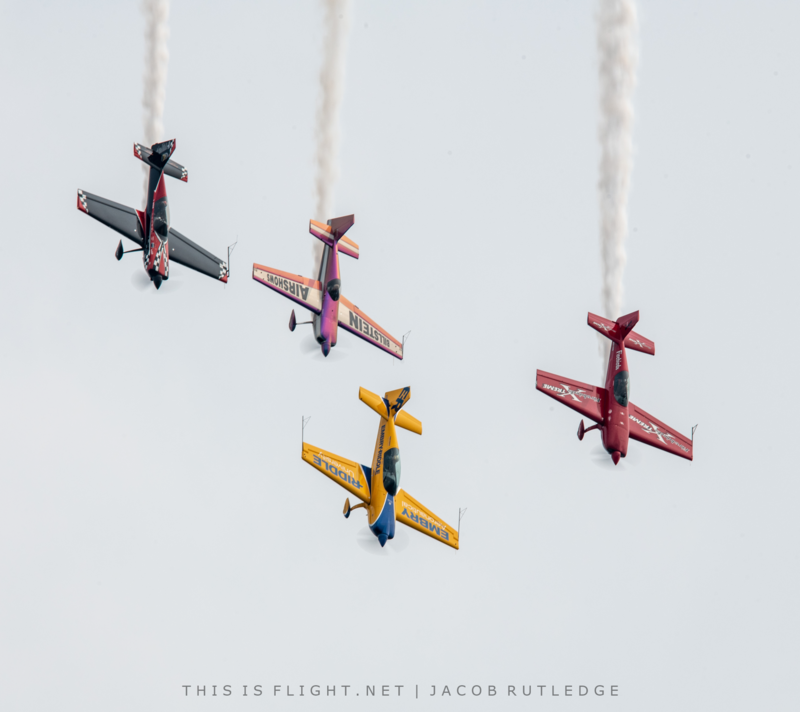 The aerobatic planes were able to fly just feet off the surface of the lake, which made for some great photo opportunities. Matt Chapman and his Extra 330LX immediately followed the Firebirds demonstration team. Matt’s routine was full of everything you would expect from an award winning pilot: Hammerhead stalls, knife-edge passes, and roll rate demonstrations were all there. Later in the day, Matt joined with Rob Holland, Jack Knutson and Bill Stein, together forming the team The 4CE, performed an exemplary 4 ship aerobatic demonstration with their respective aircraft. 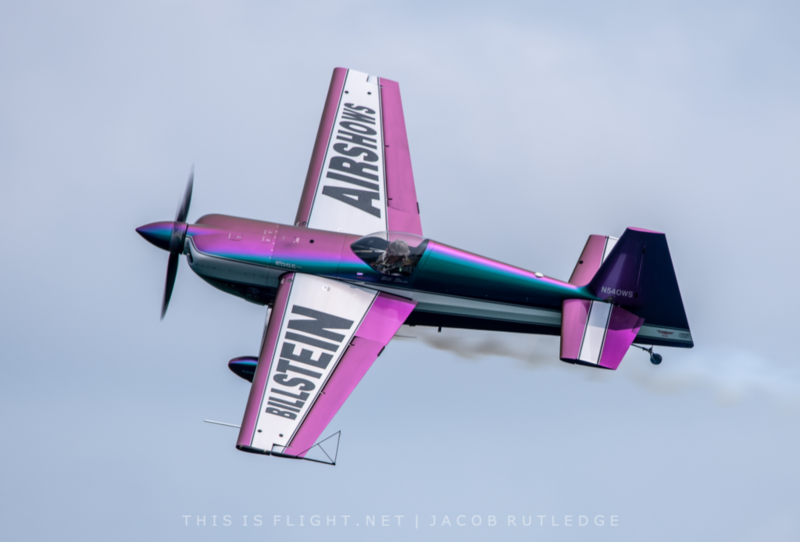 Sean D Tucker and Johnny D entered the air box immediately after Matt’s demonstration, giving us a glimpse of what the future might look like for Sean after he retires from solo aerobatics at the end of the year. 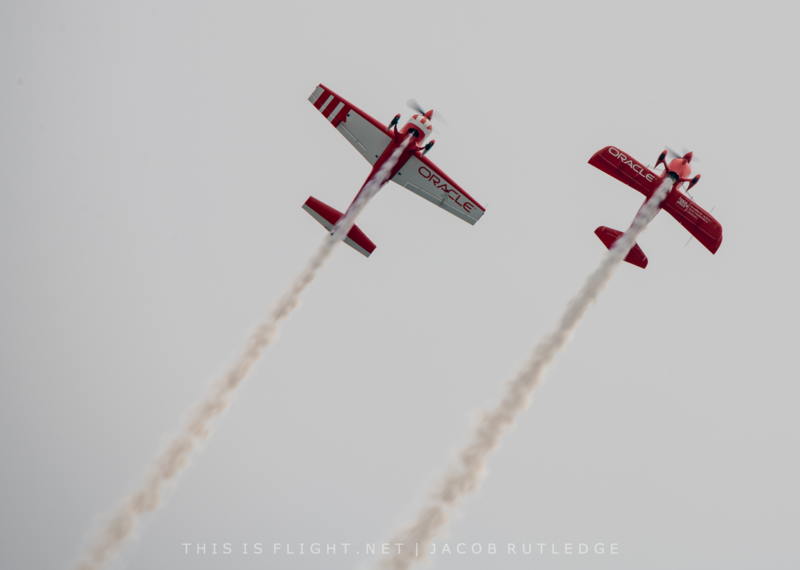 Sean and his protégé Johnny D performed a quick routine as Team Oracle, with Sean flying his iconic Oracle Challenger 3 while Johnny flew the Oracle Extra 300 L almost wingtip to wingtip. I’ve seen many two-ship aerobatic performances but this one felt especially crisp. 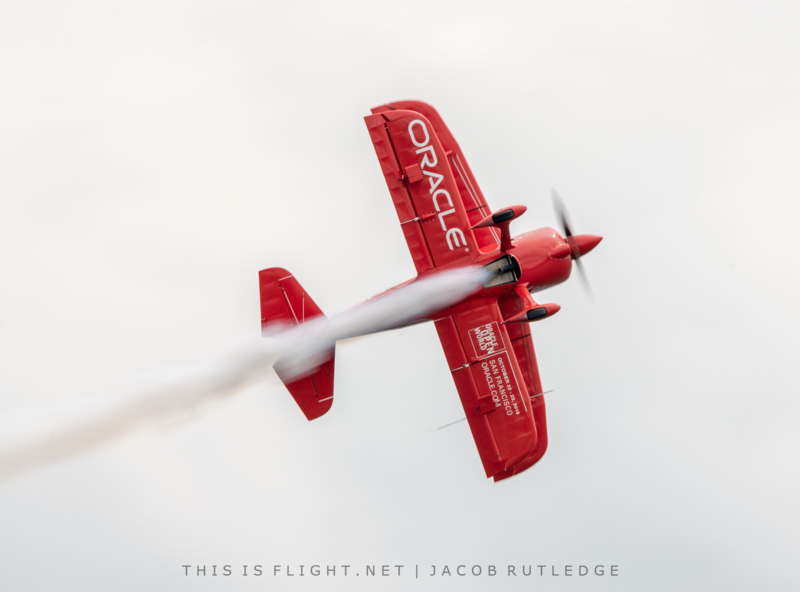 Sean D Tucker would bring back the Oracle Challenger III for a solo display later in the day but one thing missing was the Triple Ribbon Cut. For obvious reasons, the venue simply doesn’t lend itself to the feat. 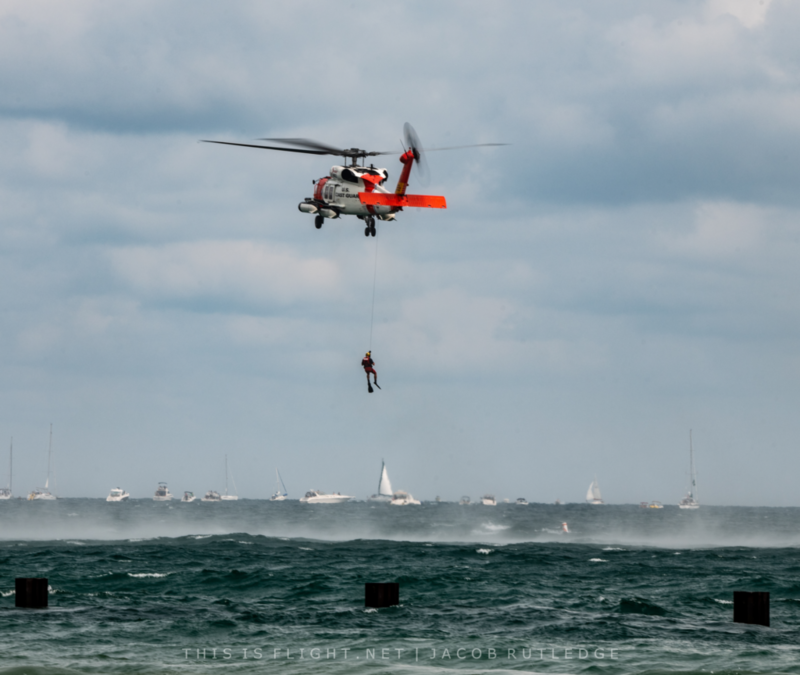 U.S. Coast Guard MH-65 Dolphin water rescue demonstration was a great way to give the audience a glimpse of one of the services provided by the Coast Guard. 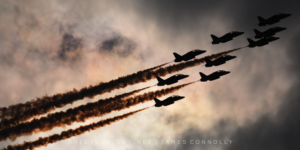 Water safety was stressed multiple times; when we think about air shows we think about honoring the past, admiring the present and recruiting for the future but this demonstration and narration might also save someone’s life through education. The water portion of the show also showcased both Chicago Fire and Police boats and helicopters. I am generally not one for surprises but during the Coast Guard MH-65 Dolphin demonstration I noticed a pair of USAF A-10 Thunderbolt II aircraft orbiting off the to the north. Towards the end of the MH-65 demonstration the show announcer formally acknowledged they would be part of the show and I knew then we were in for a treat. 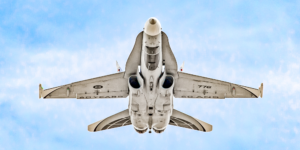 The A-10s worked the air box for several minutes with flat passes and tight turns to demonstrate its small turn radius. 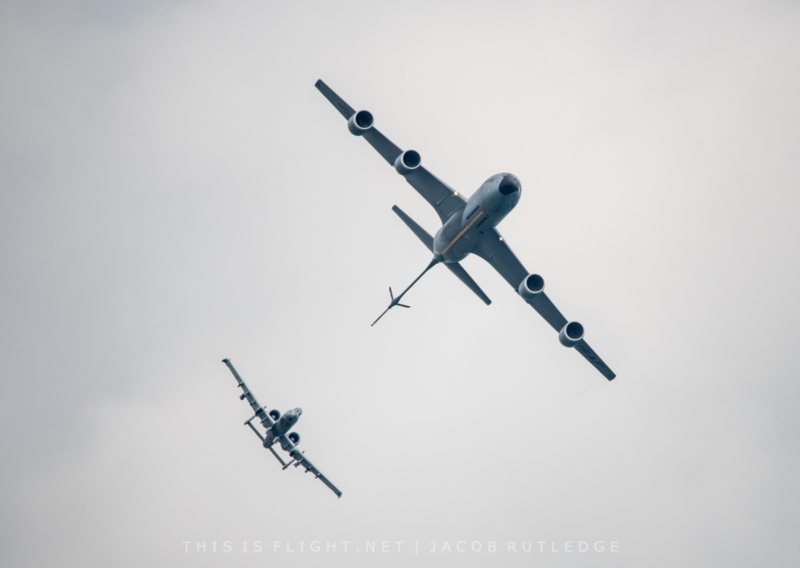 After several passes in front of the crowd, the A-10s paired up with a USAF KC-135 Stratotanker that was holding off to the north for a simulated refueling demonstration – a relatively rare sight at airshows nowadays. After the simulated refueling pass, the A-10s broke off and the KC-135 made multiple clean and dirty (flaps and slats extended, gear down) passes. While certainly not a full A-10 demo, the A-10 is always a welcomed sight. 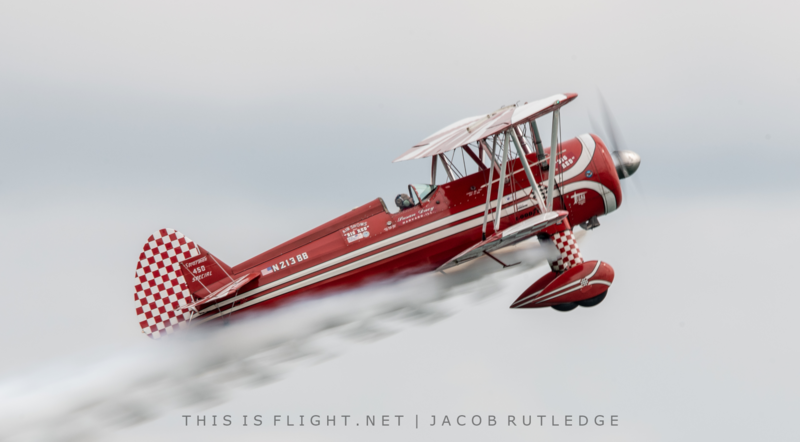 Susan Dacy and her 450HP Super Stearman Model 70 performed after the KC-135. I was genuinely surprised at how loud it was for such a graceful aircraft but no complaints here. The red and white paint scheme produced a beautiful contrast against the blue water and muted sky. The first of the US Air Force’s official demonstration teams then followed: the F-35A Heritage Flight team. At Chicago, the team’s display consisted of a rare F-35 solo display before pairing up with a P-51D Mustang for a series of formation passes. 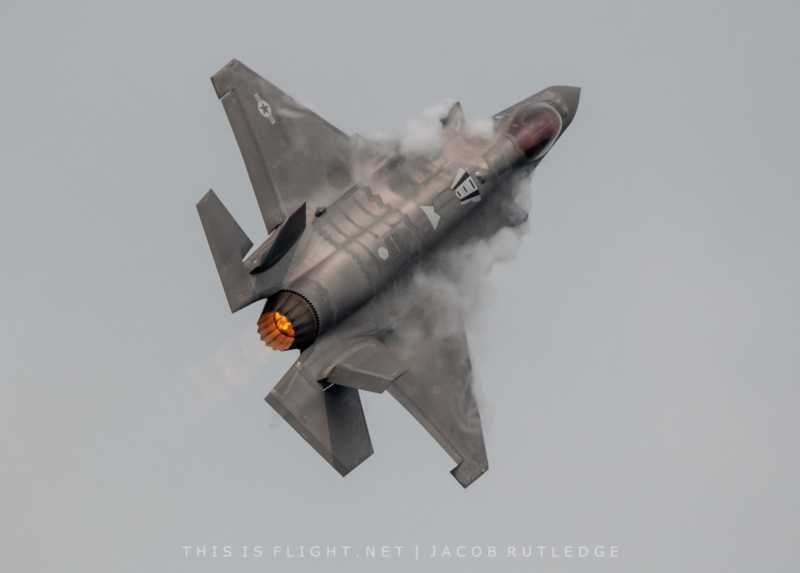 While there is no comparison to any of the US military’s official solo demonstrations, it is nice the see the 5th generation fighter in action decoupled from the P-51. Hopefully we will see a full F-35 demonstration team not too far into the future. A trio of civilian acts followed, starting with the return of Sean D. Tucker for his last solo performance in Chicago. This was followed by the four AT-6 Texans of Aeroshell. I’ve seen the Aeroshell demonstration multiple times but it never loses its luster. There is just something about those massive radial engines that really calls to my inner AvGeek. If you have ever had an opportunity to watch them perform, you know exactly what I am talking about. The final civilian act at the show was Bill Stein and his color-shifting Edge 540, which can change from blue to purple, gold and brown depending on the light and surface angle. Bill’s performance included many maneuvers down low, including aileron rolls, inverted passes and flat sharp turns, all making for picturesque images and temporarily satisfied members of the crowd that were looking for aviation action close to the lake surface. Preceding the headline act, the US Navy Leap Frogs jumped for the second time of the day, but this time there was a special ceremony where a flag that was flown with the team was given to one of the fallen Chicago Police Officers family. It was a humbling pause during the flying which the crowd unequivocally supported. Immediately following the flag ceremony followed an enlistment ceremony. Public outreach and recruitment is a big reason we are able to see military jet teams in action, and after witnessing the enlistment ceremony I appreciated seeing the results of recruitment efforts end to end. 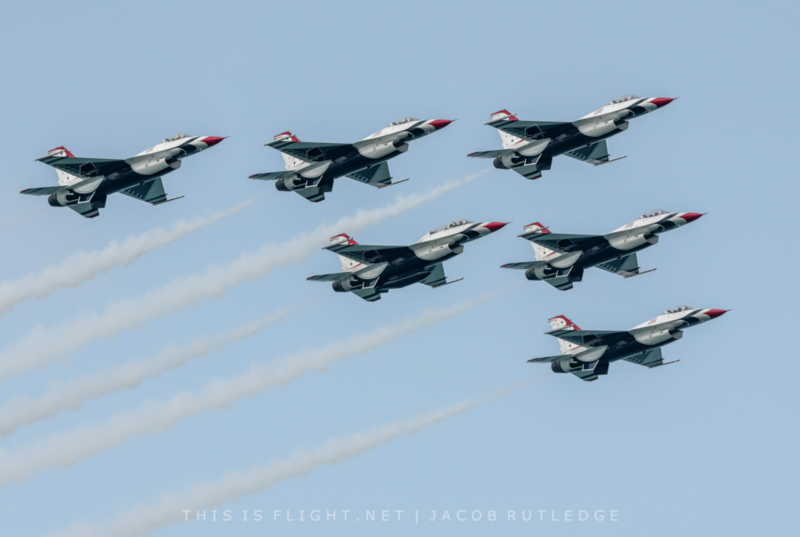 The Thunderbirds headlined the 2018 Chicago Air and Water Show with their six F-16Cs. Around the same time the Thunderbirds demonstration started the clouds began to break and the muted sky started to show some color. Chicago was a great venue to watch them perform as show center offered a 180 degree unobstructed view. I have said this before but watching the Thunderbirds, or Blue Angels for that matter, never gets old. 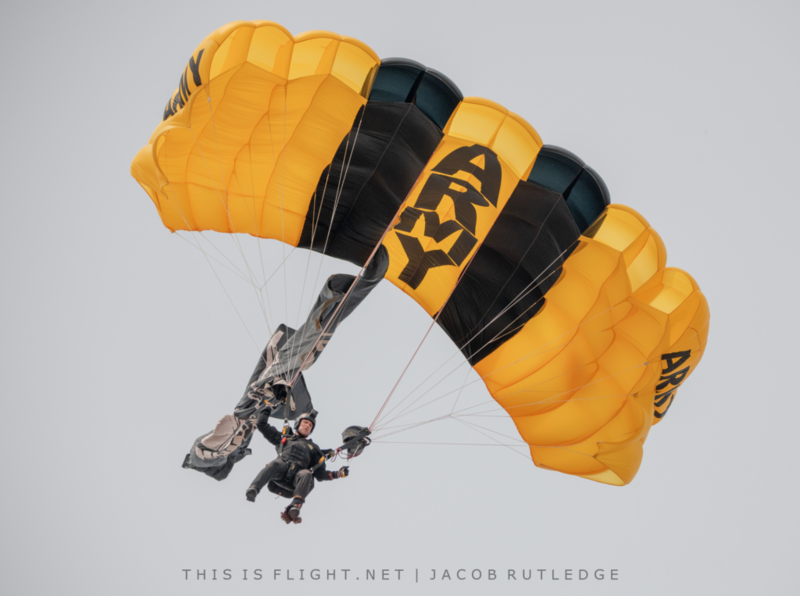 Overall the airshow flowed well with only one notable pause during the second round of Navy Leap Frog and Army Golden Knights demonstrations while the their aircraft got to altitude. The show announcer Herb Hunter did a great job by using this lull in the show to explain the streamer drop and how the team determines exactly where they will jump based on mid and low level winds. While the show provided almost continuous aircraft in the show box, however, it was also notable for its absences. Air and Water Show regulars the Aerostars and the Warbird Heritage Foundation’s A-4 Skyhawk, both scheduled to perform, failed to materialise. 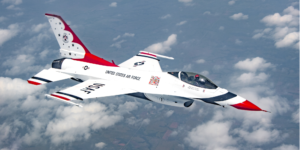 The same went for the F-18 Hornet, and the T-38 Talon. No reason was given during the show for their absence. And finally, this sounds simple but much of the spectator area is at the North Avenue Beach, and beaches have sand. As a photographer, sand is about the worst thing I could deal with on a lens next to salt water. Luckily, Lake Michigan is freshwater, but be aware that some of the area you may want to photograph or view from is sandy, so plan accordingly. With that being said, there are lots of places to view the airshow from. Boats, skyscrapers, and many public areas are at your disposal with proper planning. While most of the show happens in front of the North Avenue Beach, there is over a mile of coastline that would offer a great view. Moral of the story: plan ahead and enjoy the show. Jacob Rutledge is an IT professional by day, aviation and photography enthusiast by night. Jacob keeps his eyes on the sky from the Midwest US.